Here’s a character you may not remember by name, but if you ever watched the neo-noir Nickelodeon cartoon starring the warm hearted kid in a cold uncaring world filled with mystery, then you’ll remember Brainy as the literal punch-line to a running gag. Helga served as Arnold’s antagonist and he as her love interest, unable to express her undying love except through aggression and through private soliloquy. Although rarely were her monologues unheard, as Helga had one audience member for so many of them. Brainy was often looming just over her shoulder, chuckling asthmatically, and yet over the years he never learned to dodge her wicked back-hand. Brainy had some input on the show from time to time, he had some lines, even the odd storyline, but it’s never really explained how he preternaturally appears in the most obscure places to creep up on the unwary. A Bogeyman, banished with a punch to the face. 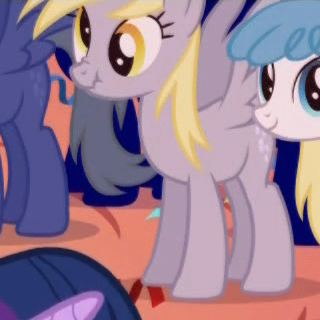 Derpy Hooves is what happens when a background character is directly mocking the series, but in such a lovable way that you don’t feel like it’s dragging it down. Derpy is a strange beast, with its cross-eyed gaze and unfathomably happy smile. You’ll notice I say ‘it’ a lot, as actually it’s been both female (which is the more canonical gender) and male for some merchandise. But this character became immortalised due to people finding out about it. The legacy of Derpy Hooves is quite a funny one, as it started off being noticed by people over on 4chan. People affectionately gave it the nickname Derpy Hooves; fitting considering the derpy expression it’s associated with. Later down the line, Derpy Hooves became more of a thing to the creators of the show, who had a lot of fun fitting the character in various locations throughout the series. A nice, but frankly useless homage to the fans and their creativity. A recurring character in our lists, the legion of guards warding Tamriel employed by the Empire, by liege lords, thanes, and house heads to keep the peace in times of hardship. It’s no small feat when you have adventurers running around, breaking into houses, picking pockets, putting buckets on heads, and willfully ignoring the plot and threat to the realm. 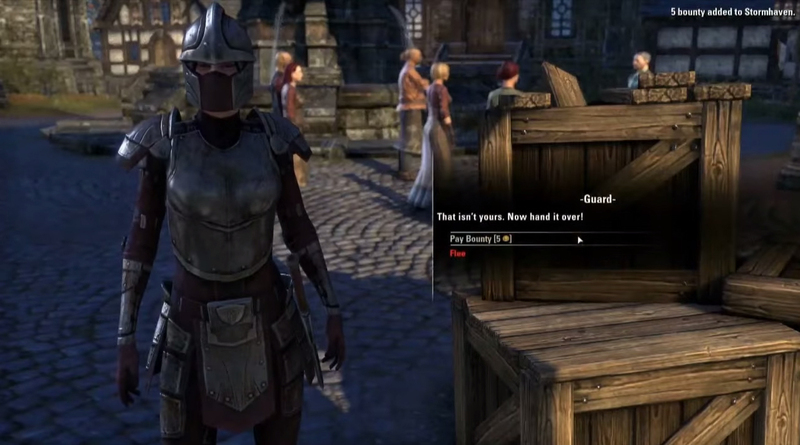 Guards are often the source of the majority of comedy in an Elder Scrolls, from the withering “Outlander” remarks from dunmer soldiers in Morrowind, to the sarcasm of Skyrim hold-guards, they’re no mere cardboard cutouts. Admittedly they’re carbon copies of one another, in most cases even having the same voice actor, and certainly all reading from the same script, but they certainly have more personality than The Adoring Fan or Lydia. Steve is a casually dressed guy in a bandit mask, although he seemingly lacks the maniacal bloodthirst of your average villain. 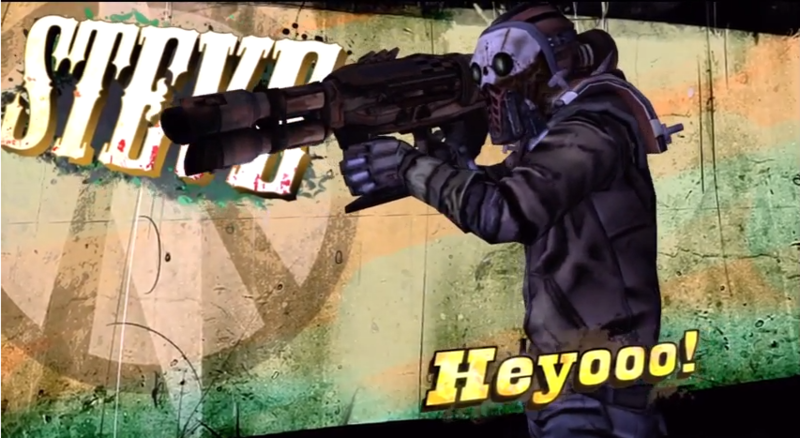 Ok, so he’s got a pistol, and is more often than not seen casually filling people with bullets on the whims of Claptrap, but he’s a friendly guy willing to chat and always ready with a friendly greeting. Always the same greeting, “Heyoo”. He was a far bigger character in Poker Night 2, ushering competitors out of Moxxi’s bar as they drop out of the game, mostly with a bazooka. Take a wander around the landscapes of Pandora and you’ll inevitably stumble across him somewhere dotted around, and he’ll give you a cheery wave, a huge grin (I assume) and a heartfelt Heyo! This one is so self explanatory, that I think all I need to do is share the above video with you – and we’re done with this section. … Okay, okay, you want some form of explanation. My Leg is a common phrase shouted by one background character throughout Spongebob Squarepants, typically when something happens off-screen. With 25 episodes and 1 film appearance behind this background character and it’s infamous catchphrase, this is one of the longest running gags on this list. There’s genuinely little else to say about Fred though, as he’s typically just a customer, or just a bystander. At least he’s distinctive enough! Yet another nameless character subject to the misfortunes of being too damn close to the antics of main characters. Known as “Cabbage Merchant”, better known for his forlorn cries of “My Cabbages”, as his cartful of produce is overturned, devoured, or destroyed with grim regularity, no matter where he wanders. From Omashu to Ba Sing Se he is thwarted in his every attempt to peddle his wares, and yet adversarial conditions barely slow him down. After selling his story to a renowned playwright, he apparently gets the cash together to settle down, start a business in a fixed (and less vulnerable) location. And from what we can gather at the dawning of the Legend of Korra it did rather well, as Cabbage Corp ar one of the biggest industrial groups in Republic City, where a statue commemorates his legacy. Uatu the Watcher, observer of the endeavours of humanity, the great impartial witness and gatherer of boundless stores of knowledge, the chronicler of ages. Also quite possibly wearing a Stan Lee disguise for the last twenty years or so. 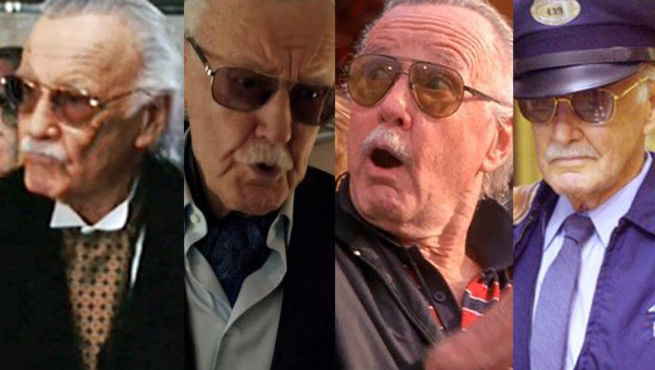 Stan Lee appears under various guises throughout Marvel’s long and successful big-screen history, appearing subtly and increasingly unsubtly over the years. You could easily miss his fleeting appearance in Iron Man 1 as Hugh Hefner, you might have glossed over the older gentleman stopped by a young Matt Murdock from wandering into traffic, but no way you can ignore the librarian obliviously cataloguing as Spider-Man wrestles Lizard in the background, or the doddering postman with a parcel for Tony Stank. Ok, so these days he’s less Easter Egg and more supporting cast, but he deserves to be a household name. Can a prop be considered a character? 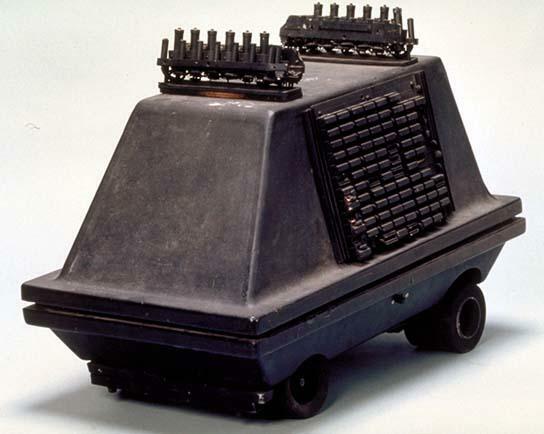 I’d say so if it exhibits as much warmth and personality as some of the main cast, in fact this little box on wheels delivers a more powerfully emotional performance than Boba Fett and Hayden Christensen combined! Appearing in four of the seven core-films and prolifically throughout the property, the tiny repair drone is an excellent little background detail to cement the technological advancement of the distant galaxy. Still don’t remember the MSE-6? How about when Chewbacca was being escorted through the Deathstar with Han and Luke disguised as stormtroopers? A little Mouse Droid comes scuttling along, whistling merrily to itself only to be confronted by seven foot of growling fur, and is sent fleeing back down the corridor with a high-pitched squeal! One of the funnier scenes in the series, and you are guaranteed to remember the little black boxes when you see it scampering through empire facilities in future. Avid fans of Trigun will know the name of this pesky black cat that shows up from time to time, as it’s a little easter egg put in by the creator of the series, Yasuhiro Nightow. She’s a wonderful little cat, who is also known as ‘Black Cat Space’, which is a bit of a weird, perhaps overly literal translation of what the cat’s all about. Very little is known about her, she’s just this sweet little cat that appears in just about every episode at least once, as well as the intro and outro of the anime series. Sometimes, she’s involved directly with the events in the scene and other times, she’s in the background, asleep or walking around. Whatever she’s doing the whole time, she’s always fun to spot. But there’s only one background character who we care about so damn much… One character we want to find even more than Kuroneko-sama. Naturally, this one had to go to Wally from the popular children’s books, Where’s Wally. 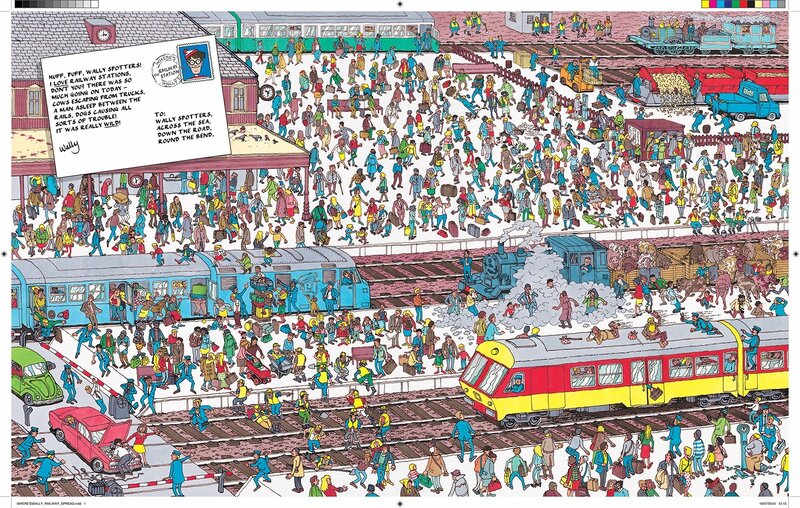 If you’re American, you may know of this as Waldo instead, which seems to be a localisation change only. The appearance is the same and the premise of the books are exactly the same; huge scenes with strange things happening throughout, where you must look around and locate the titular character, Wally. You may think it’s strange, considering he’s the one you need to look out for, but the problem with Wally is that he’s designed as a background character from the get go. He’s literally what you’d expect from a character you aren’t supposed to care about – Which makes him all the more fitting to be the main character in this book of background characters. Yes, he’s just a background character who was given more importance than his contemporaries. How do you choose from a voiceless, faceless cast of billions? How can you narrow down so many famous faces like… that guy… or her… to just 10? We didn’t, we never do, there’s always a couple of honourable mentions. Ever wondered what we look like from the perspective of a common villager in a fantasy world as we charge through in pursuit of greatness and glory, laden with the kind of loot that could buy and sell them twelve times over? Worse yet, imagine being locked in a perpetual dialogue loop, or watching a guard bleed to death in front of you while dismissing the arrow in their neck as “Just the wind”. Such is the life of Viva La Dirt League’s Epic NPC man, the non-player character’s perspective on preposterous game logic and life inside a poorly simulated reality, Greg the garlic farmer, somehow the proud owner of a limitless supply of one-of-a-kind relics and highly valuable magic items, who lives in a shack that he can never enter. He’s a guy who I felt so wholly connected to I was moved to make a costume inspired by his life and works. 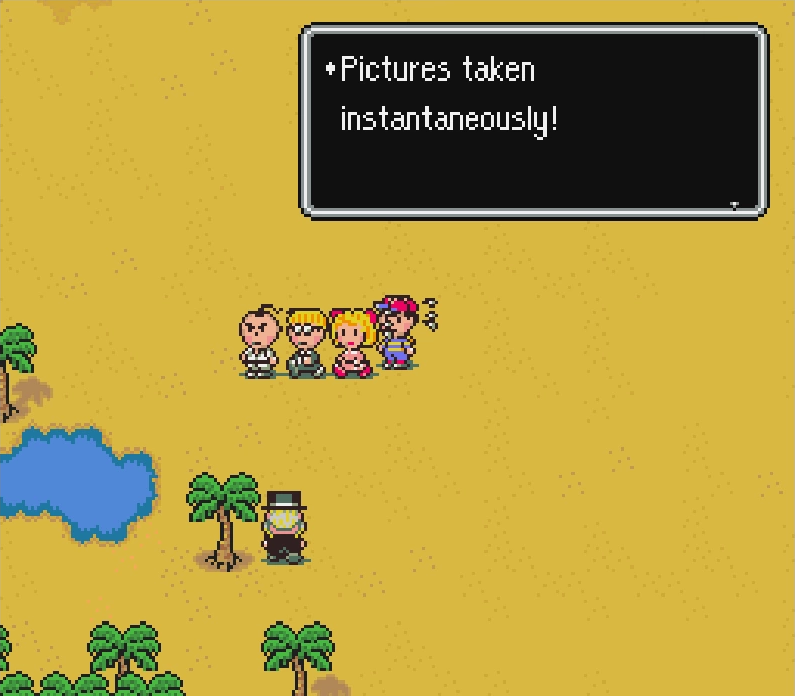 From time to time, as Ness and his friends are travelling the world of Earthbound, they come in contact with this kindly old man who is keen to document their journey. It’s a little strange that he literally falls from the sky, stopping time in the process, but a great photographer have their ways of taking the perfect shot – and it suits Ness and his companions just fine that he pops in from time to time. Whether he’s truly a background character is totally debatable, as he literally stops time to make you have a picture taken. Whatever your thoughts about this cameraman, he’s dedicated to his craft in an unhealthy way. In this day and age, a man of his calibre taking pictures of young children really wouldn’t fly – But while Ness has his trusty baseball bat, at least they know they’re safe. Now starring in the role of Forgettable Extra, the filler text between the end of our list and the poll for next week’s unmissable, unignorable Top 10! Cast your vote below. Which background character stuck out in your mind? Which extra did we completely forget? Will any of these be promoted to D-List cast members, with names and lines, or even a scene of more than seven seconds screen time? Be noticed in the comments section down below, or on our Facebook and Twitter pages! 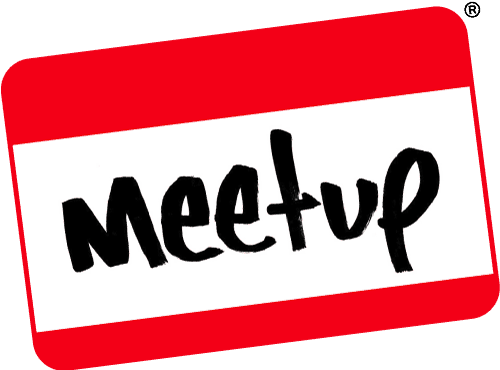 This entry was posted on November 11, 2017 by GeekOut Team. It was filed under Top 10 and was tagged with avatar, Background Characters, Borderlands, Brainy Hey Arnold, Camera Man, Derpy Hooves, Earthbound, Epic NPC Man, guards, Heyo, Kuroneko-sama, Marvel Cinematic Universe, MSE-6 Mouse Droid, My Cabbages, My Leg Guy Spongebob Squarepants, My Little Pony, Stan Lee, Star Wars, Steve, the elder scrolls, Top 10, Trigun, Viva La Dirt League, Waldo, Wally, Where’s Waldo, Where’s Wally. Great post! I definitely agree with some of the selections on this top 10 list. Brainy is still a running joke with me and my friends. I’m always sneaking up and breathing heavily when someone is trying to have a private conversation. It’s just so funny!